This house-museum is associated with the history of the invention and spread of typography. 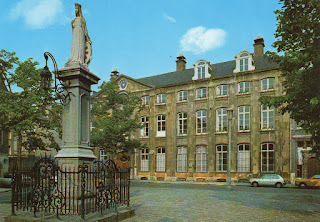 The Plantin-Moretus Museum (Dutch: Plantin-Moretusmuseum) is a printing museum in Antwerp, Belgium which focuses on the work of the 16th century printers Christophe Plantin and Jan Moretus. It is located in their former residence and printing establishment, the Plantin Press, at the Vrijdagmarkt (Friday Market) in Antwerp.